Another Mackie workhorse, well designed, solidly built and only a mild tendency to sound too hi-fi. Solid build. Improved bottom end. Perhaps a tad too hi-fi? 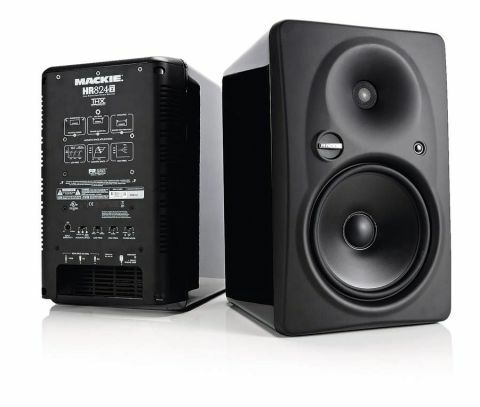 The original Mackie HR824 monitors were announced in 1997 and quickly found a space on the meterbridge of many studio consoles for their robust design, solid sound and reasonable price. Ten years later, Mackie has decided to release a mark 2 model, which bears similar specs to its predecessor, but was designed in collaboration with EAW. The ﬁrst striking difference out of the box is the curvier cabinet and its glossy ﬁnish - the angular edges are gone, it's heavier and its dimensions are all slightly increased. A clever restyling has brought up to date the look while retaining the blueprint of the original 824, and more importantly it has improved the acoustics by reducing edge diffraction. Still handily on the front panel, a new round power switch replaces the original rocker. A plastic ring around the button lights up in a clean white colour, only to turn red when the electronic limiter kicks in. Apart from the Mackie logo, nothing else clutters the front panel. The new LF driver is slightly larger (8.75inch instead of 8inch), but it's such a perfect match to the bigger cabinet that one might think that the 824 mk2 features the same drivers, for proportions are unchanged. A large wave guide, similar in size and shape to that of the 824, surrounds the 1-inch HF driver. A new passive woofer is rear-mounted, concealed behind the power ampliﬁer assembly, with increased dimensions and improved specs. On the rear panel, a recessed slot under the protruding amp module accommodates the 3 inputs provided (XLR, TRS and RCA, all paralleled together) and an IEC socket. This allows for against-the-wall placement, as all cabling falls vertically down, and no connector can extend beyond the proﬁle of the speaker. Controls on the rear panel are unchanged: an input sensitivity, an acoustic space choice between A (- 4dB, for corner placement), B (-2dB, for against-the-wall placement) and C (normal or freestanding) which dims the low frequency output to match your listening environment. There's also an additional low frequency ﬁlter for bass management use, with choices between 80Hz (THX standard), 47Hz (any other subwoofer) and 37Hz or normal. The high frequency ﬁlter has settings of -2dB, 0dB and +2dB, and ﬁnally the power mode switch which ﬂicks between standby, on and auto on (incoming signal triggers the amp on and long silence will switch it off). I had the HR824 mk2 on two recording sessions, in different studios, competing against my fave KRK V6 mk2. I'm familiar with the classic 824s, and I was impressed by the deeper and smoother bottom end response of this new pair. The HF driver is very accurate, never overpowering nor sizzly. The original 824s had a tendency to sound overly comfortable - when listening enjoyment overcomes attention to details. The 824 mk2 are no exception, with perhaps the difference that the further-enhanced bottom end is even more removed from the silky top, leaving the mid-range area dangerously bare - as I discovered when tracking electric guitars. A quick safety check on my KRKs - notoriously proud in that area - convinced me that I didn't need to worry. The amps are rated at 250W together, which means that when you need them loud you might see the limiter ﬂash the red light every now and again. The HR824 mk2 are good, solid working monitors, and deﬁnitely deliver an improved package over their acclaimed predecessor.